This page is pretty general. Music software is such a fast-moving field that there would be little chance of me keeping up with it, even if I felt like it (which I don't). But if you are new to all this you might find some useful info here. 1 If you desperately want to hear my first attempt at electronic music, my (cough) masterpiece can be found here. 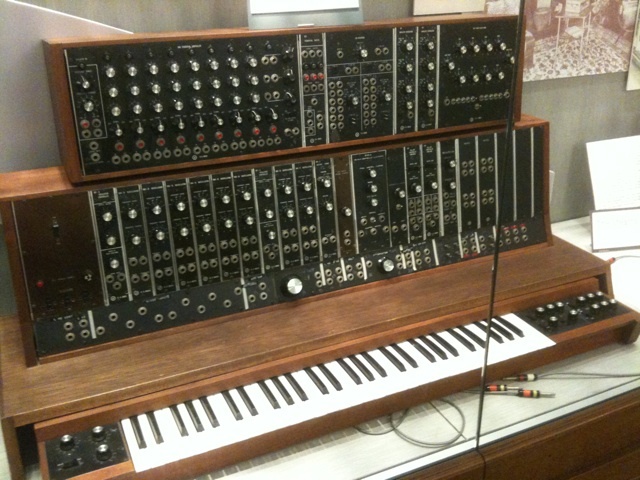 The first commercially available Moog® synthesizer, 1964 (pic from Wikipedia). I cut my e-music teeth on one of these (I'm not telling when).1 Missing from the picture are the about 100 patch chords that usually snaked all over the surface. Music creation has been transformed in the last 40 years or so by handful of developments. The first was the development of electronic music. The 19th century had see the development of electronic transmission of sound and the ability to generate sound electronically. This industry continued to develop through the first half of the 20th c. and by the 1950s electronic organs were becoming compact and light enough to be regular traveling band instruments. The late 1970s brought communication between electronic music devices, although on a strictly manufacturer by manufacturer basis. In 1983 Dave Smith and Chet Wood designed an interface, which permitted communication between equipment from different companies. The major manufacturers got together and agreed on a standard for inter-device instructions. The result was the Musical Instrument Digital Interface, or MIDI standard. This allowed you, for example, to control one music synthesizer from another. As the microcomputer industry developed, that format was converted into a storable language so that music could be stored on computers, and sent back to control synthesizers. As the computers got more powerful, it became possible to include the entire music-producing portion of the synth inside your computer. Of course, you still need a keyboard or some other device to input the music, although if you are patient enough, you can also enter the necessary information directly from your computer keyboard. Nowadays, music software programs fall into a few major categories. The first is the simplest, and the least interesting. 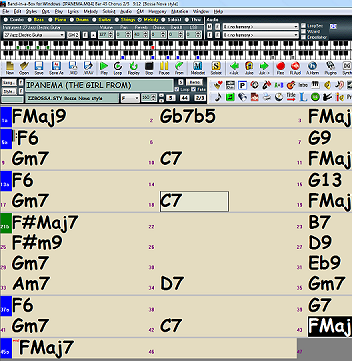 These are programs intended to emulate some musical instrument. Keyboards are the most common, although others are possible. Of course the process of playing them can be odd. There are also support programs. The most common are tuning tools and electronic metronomes. Some are on-line apps, others need to be downloaded and run locally. Obviously, the level of complexity determines this last feature, to some extent. MIDI, however, allows you to create and store the kind of music we have been talking about so far directly on your computer. Programs that do this are called sequencers, and there are a group that are designed to allow entry of traditional musical symbols, and then will also play them back, or create transmittable MIDI files which you can use to control your synthesizer devices (e-pianos, etc.). I highly recommend you obtain one from this category for use while you are going through these lessons. 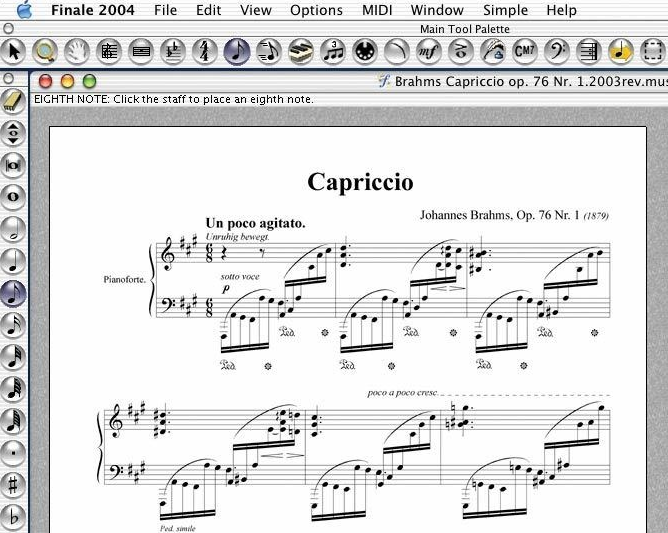 These are programs that will allow you to enter music score directly into the computer (or a MIDI instrument connected to your computer) and save just as you would a text file. There are two front line commercial offerings in this field: Avid’s 'Sibeleus,' and Make Music’s 'Finale.' Both of these programs are now marketed by large software corporations, and only cost a little less than your car. They are both excellent programs; I have used both. My experience is that Finale is a little harder to learn, but not by much. It is also slightly less buggy. If you are going to go with one of these 'big hitters,' I highly recommend finding someone you can call when you are confused, and pick whichever program s/he is using! There are other options however. 'Notion' by Pre-Sonus makes a less expensive alternative, but I have never used it, so I can neither recommend nor disparage it. If you are just getting started, or even you are an intermediate user, I would draw your attention to 'MuseScore', which is free. It is a little clunkier; the graphics are not as clean, and the built-in sounds are clearly not as nice. However, its basic note entry methods are somewhat more intuitive, and did I mention that it is free? The kind of inter-corporate cooperation that made MIDI possible has never emerged in the score production world. Saved files are not readable by other programs, and no standard interchange format has emerged. I suspect this will change, but to date it has not. Until there is a clear interchange format, there is also not going to be any standard for display of this kind of data on the web. There is a UNICODE standard for musical symbols, but nothing for displaying them as anything but text, which obviously will not work. Some of the manufactures have developed internet formats, but in order to use them, you have to get the add-on from the manufacturer, and your friend who uses a competing product will not be able post. All of these score programs can read and write MIDI, but although that will get you the notes, you may find the results are kind of ugly. The other significant contribution that the software industry has provided us is in the area of recording software. These programs are not normally designed to aid in the writing process, but one you want to record something live, there is no longer any need to go out and buy a multi-track tape recorder. The offerings in this area are vast, and although I have used several, the learning curve for one of the more sophisticated packages is sufficiently steep, that you will not want to put the time into too many. Pick one and go with it. The oldest and still the high end in recording software is called Pro Tools (also an Avid product). It is not the high-end by much though, and once again, if your buddy uses a competing product, and is willing to be your go-to when you inevitably have questions, that is probably the best way to go. There are a few quite acceptable entry-level products in this field, and several are freeware or shareware. On Macs, GarageBand will take you well into home recording without needing to spend a bunch of money. For PCs, I like NCH’s 'WavePad'. 'Audacity' is available cross-platform, which is always been a good feature in my mind, in case you find yourself changing computers, or your experienced friend is on the other side of the great OS divide. It is also open source, if that sort of thing excites you. If you are aching to go pro, do your research. Any link I put here will be out of date in a month. The big players are always playing leap-frog and buying good ratings on review sites. Watch for reviews that compare a few companies' high-end products to the competitions low end offerings. Surprise! Their favorite product wins. Not surprisingly, though, there is no cross program compatibility here either (some products are cross-platform, though, but there are some work-arounds if you find you have to trade tracks with someone in another digital universe. Most, if not all, programs output their individual tracks in a standard format. WAV or AIFF are the most common. These are usually interchangeable, with a couple of caveats. Since most of these programs will allow you to make up a track from multiple unconnected fragments, if you just save the fragments, you will have a devil of a time recreating the complete track in the other software. Use the software's built-in ability to combine all your fragments into a single track, save that track, and you will have a file that can usually be imported as a single track in the other software. But keep the fragmented version in your original in case you decide to do something different with it. You will have to do this independently for each track. Effect plug-ins are often not portable either, but their settings are similar from package to package. Write them down. You may actually have to use pen and paper! (What?!?!). Finally, don't keep anything important in a compressed (lousy) format like mp3. I listen to mp3s all the time, but I wouldn't store anything important that way. I do have a couple of thoughts that the reviewers might have overlooked, though. What I said above about Audacity applies even more forcefully to high-end software: Look for products that are available cross-platform. Don't get me wrong. There are some very good programs that are targeted for only one system (more often, the Mac), but you don't know what computer you will be using 10 years down the road. You may even find yourself working with someone else who, uh, swings the other way! Invest your time in software that can move wherever you go. Second, if you are hoping that somewhere in your life's musical journey, you will be working in a studio or other professional sound environment, fork out the extra money and go with Pro Tools. I am not going to say it is the best—that would be way too subjective—but it is the industry standard. One development in all this is the emergence of pre-recorded, and stretchable, sound clips. You need a background strumming guitar? Why worry about mics and getting in tune, you simply select the strumming style you are looking for, plug in your chord progression, and the program puts the part together for you. Piano, bass, lead guitar-all are available at your fingertips. Band-in-a-box offers the chance do whole arrangements, with a large variety of available styles. Their demo video is impressive, however I personally found it both limiting and difficult to use. This may tell you more about me than anything else, though. It doesn't really want to play anything that is not in ⁴, and it kept deciding for me what I wanted, making it difficult to do anything else. Never-the-less, it provides a lot of options. I have little doubt that you could use it to put together a hit-worthy demo. Of course, it won't provide your vocals, although it will compose an array of standard harmonies for you. This pulls together ideas that have been available in other recording packages for a while, however. 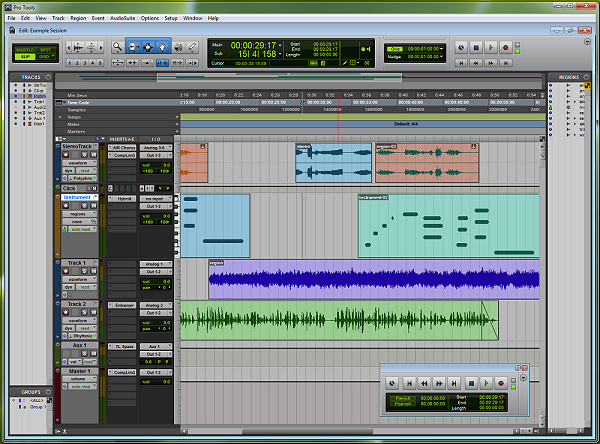 High-end recording software often comes with pre-recorded samples which can freely be used with their software. These are often stretchable (you can lengthen or shrink them, change tones/chords, and, of course, loop them to your heart's content. You have been able to do this for a long time with instruments that lend themselves nicely to MIDI (keyboard instruments, most single note instruments, percussion, etc.) so all you really need is a means of entering the data, and a good sample based synthesizer for rendering it. More sophisticated performances on any of these instruments usually require a human touch. Lead samples and things like that can fill in that gap. Keep in mind that other people's ideas are not really yours, but then if you ask your friend to come lay down a sax part on your song, that part is hers. Still not yours. Always back up your work. And don't forget to backup regularly. Also, save regularly. I can't tell you how many times everything was looking good, and just before saving, the program froze (I lost everything since my last save). Big programs are very hard to keep bug-free (even small ones), and you don't want to be their next victim. In the next section we will be plunging into music theory proper, talking about pitch, notes, and scales. See you there.